EAST LANSING, Mich. --- By analyzing vegetation information collected by satellites over time instead of for just one day, scientists in the Michigan State University Center for Systems Integration and Sustainability (CSIS) have developed a novel procedure to assess the composition of plant species in an area. Researchers long have used multi-spectral images (which include radiation outside human perception, such as infrared) and other remotely sensed data to create maps of vegetation around the globe. But seasonal changes in vegetation can limit the usefulness of these procedures, making them accurate for only the particular day or season when the data was collected. "We analyzed the variability of the electromagnetic spectrum over time, in response to the temporal variability of the vegetation in an area," said Andrés Viña, assistant professor of fisheries and wildlife and lead author. 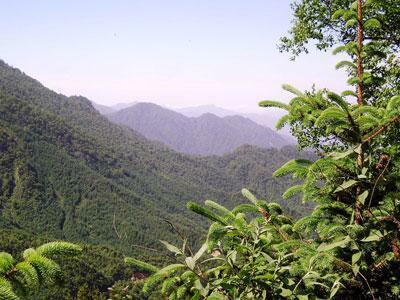 "We calibrated our analysis with information on plant species composition we had collected in the field at our study site, the Qinling Mountains region in the Shaanxi Province of China. So instead of looking at a snapshot, we looked at the area over time. Now we can say if two places exhibit similar temporal variability, then they are probably floristically similar. "This procedure allows resource managers to assess the plant biodiversity of a region without having to do the painstaking work of collecting regionwide field data," he added. The study site was in the Qinling Mountain region in the Shaanxi Province of China. The paper, "Relationship between floristic similarity and vegetated land surface phenology: Implications for the synoptic monitoring of species diversity at broad geographic regions," is published online in the June 2012 issue of Remote Sensing of Environment. Viña explained the two types of diversities: alpha diversity is diversity of place and beta diversity is diversity from one place to another, the focus of this research. "This is the diversity we were interested in, the beta diversity," Viña said. "If one area is similar to another in terms of the timing of natural events, such as leaf emergence, flowering, fruiting and leaf senescence along the seasons, can we say that the floristic composition will be similar? Our research has demonstrated that this is true." Viña said the research could likely apply to other geographical areas with strong seasonality. He and his colleagues plan to test the technique to see if it works in places without strong seasonality and/or that have a very high number of species, such as tropical rain forests.